I call this a fiesta salad because it just looks like a party! The colours are amazing! The next best thing about this salad is the roasted kernel corn. Roasting brings out the sweetness in the corn, that complements the spice of the onion and jalapeno pepper so well. This salad is rich in fibre, vitamin C, folate, protein and iron. 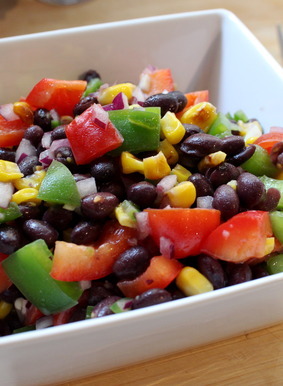 The rich source of vitamin C in the peppers will help your body to better absorb the iron in the beans. Enjoy this salad on its own or as a side dish. 1) In a bowl toss the frozen kernel corn in 2 tablespoon of Camelina oil. Roast in the oven on a cookie sheet until the corn starts to blacken, about 12-15 minutes. Let cool. 2) Combine all the remaining ingredients in a large bowl with the corn. Mix well. Serve cold. Hint: the longer it sits, the more the flavours pop!